Venetia Diamond Mine, Limpopo, South Africa. Map and News. Elearning. Explore the geometry in the Venetia Diamond Mine, Limpopo, South Africa, through detailed Google satellite imagery. To Pan: click and drag the map. Take advantage of the zoom bars. 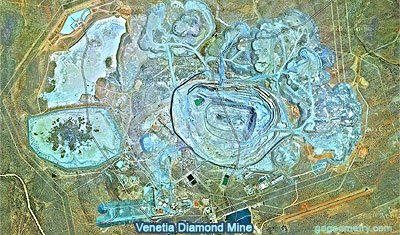 The Venetia Diamond Mine is South Africa's largest producer of diamonds. It is situated close to the South African town of Alldays in the Limpopo province. Read more. Venetia Diamond Mine and Circular Shapes.